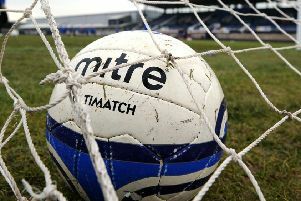 Dalbeattie Star and Kelty Hearts must do it all again on Saturday at New Central Park after a goalless 90 minutes at Islecroft. The visitors may have had the edge in terms of possession but it was the home side that had by far the better of the chances. So much so it was the Kelty bench that was screaming at the referee to blow the final whistle at the end of added time as Star piled on the pressure. As the players left the field it was obvious which set of players were happier with the draw, but Star will travel north knowing they have the ability and capability to get the required result. Missing top scorer Dean Brotherston and after a cagey start, Dalbeattie attempted to make headway on 37 minutes when Scott Milligan wriggled his way past a couple of challenges and forced Christie into a smart save low to his right at his near post. Unfortunately, for the home side, the rebound would just not fall for either Jamie McHarrie or Lewis Sloan and the ball was eventually cleared. In the 66th minute it was the away fans who roared thinking they had scored but substitute Matthew Gay’s shot hit the side netting much to the home fans relief. Star stepped up the pressure but it was Vinnie Parker to the rescue at the other end when he did superbly well to punch clear Stephen Husband’s inswinging free kick. The best chance of the match came with six minutes left when Sloan’s clever left footed cross found Todd in the centre six yards from goal. He rose well to meet the ball but Douglas somehow got himself in the way of the header and diverted the ball for a corner. Park then called Christie into action with a 25 yard shot and a minute later McHarrie fired in a left foot drive that flashed across the Hearts goal. It was a good day for the Lowland League clubs in the Scottish Cup but who will be the next to join the rest in the second round, with the reward for winning this tie being a trip to Peterhead.